Because, really, the privacy screening a hedge provides often only makes a difference when you’re outdoors during the clement seasons. 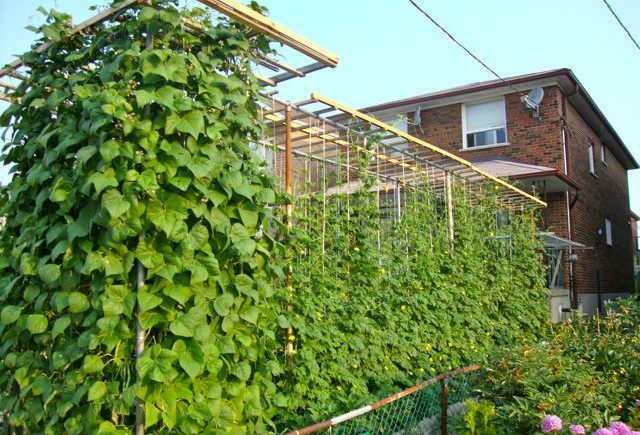 Why not use it to support your beans and cukes – which can be highly ornamental, as well as being practical and delicious. A more decorative frame might have more good-neighbour appeal, and I perhaps might have chosen to paint those danger-yellow recycled buckets. Yet, with some finishing details here and there, the overall skeleton for this trellis could be quite attractive. Picture a pergola framework with beveled ends, and the whole picture takes on a different hue. I think this is a great idea, worth refining, if you have the space, the sun and a firm hand with a jigsaw. Haha the "danger yellow" buckets are a bit much but what a great idea for a hedge! A decorative pergola frame would also be much nicer to look at in the winter. Where is this? 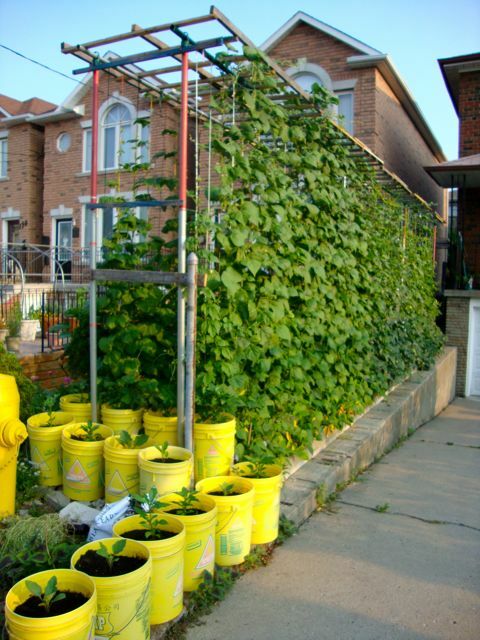 Inhabiting_trees: This is a garden in East York just west of Woodbine in Toronto. Many of the houses on this east-west street (in a neighbourhood with strongly pragmatic Mediterranean roots) have front yard veggie gardens, but this one was the most intensively planted. Tasteful: Yellow for blueberries seems like a good colour combo. My telephone peas have been working as a screen this year. I love it! It's a great idea. Usually city folks are so worried about their lawns and how green they are, this makes fabulous use of the ground. The fire hydrant blends right in with the yellow buckets. Love this, and can imagine all sorts of options for creating one. Reminds me of my elderly Auntie's backyard in the suburbs… Italy-born uncle exposed me to my very first edible garden. Grapes, of course! among the bounty. This is a great idea! Decorative and tasty. Thanks for the post. It was great to see y'all in Buffa10! 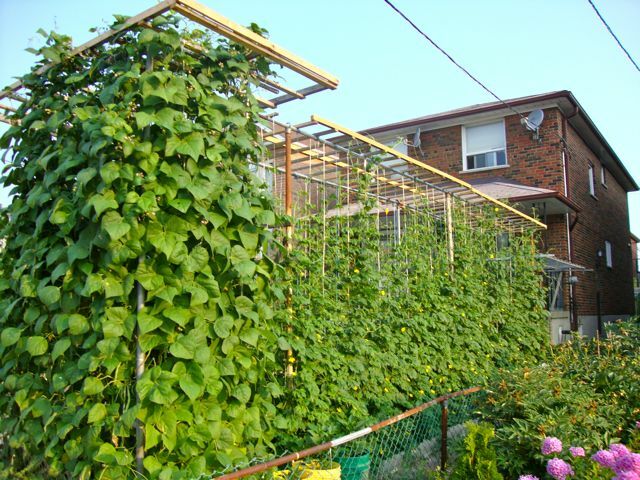 I love this idea, and have some small trellises at the back of my yard, but not as big as this. Need to learn how to use a jigsaw!